When we first start working with a green horse, we get his trust by working with him in a relaxed and rhythmic way whether we’re catching him, grooming him, or doing some groundwork with him in some kind of pen. You want the horse to be comfortable with your presence and with the general pattern of what you’re going to do today, based on what you did with him the day before and the day before that and the day before that. When it’s time to ride the horse, you introduce him to the saddle and the blanket and the bridle in the same relaxed and rhythmic way, breaking everything down into the smallest possible bites you can think of. The same goes with introducing the rider’s weight. Now you’ve got the horse accepting the bridle and the blanket and the saddle and the rider mounting and the two of you are just standing there in the arena waiting for the next thing to happen. Maybe you’re scratching him and patting him to keep his attention. At some point, the feeling’s going to change for him and the horse is going to offer to move a step. Your job is to allow the horse to move however he wants and to just follow whatever he does. You allow his freedom of gait. Freedom of gait means the horse can reach forward with his hips and shoulders without meeting any resistance. That means the rider’s not bumping him in the mouth or pulling on the reins or shifting her weight. Basically, the rider doesn’t interfere with horse’s natural movement. Now freedom of gait is a very basic, simple concept. We want to let the horse figure out how to move on his own now that he’s got a rider’s weight on his back. Your job at this stage is to stay out of his way and to stay over his center of balance while you follow his motion. You’re going to leave your reins long and loopy. You’re not going to use your weight or your legs or your reins in any way that interferes with the normal way that the horse moves. You don’t want to constrict him or confine him in any way because when you do you can actually deteriorate the quality of his gait. This is an easy concept to think about but not always an easy one to execute. Normally we’re quite willing to allow horses to move freely when we’re working them from the ground. When we get on their backs, however, our own fears or lack of riding skills begin to limit us. When we limit the horse’s movements to what we’re comfortable with so we can stay on and stay in control then our limitation becomes the horse’s limitation. Think about the kind of basketball player little Michael Jordan would have become if his parents had tied his feet together every time he jumped in the air, if they always told him to keep his feet on the ground because all that jumping in the air made them uncomfortable. The horse’s limit should be their own physical limit. And every horse is going to have one. Not every horse is going to be a grand prix dressage horse. Not every horse is going to be an upper level event horse or a top reining horse or a top cutting horse. But every horse should have the opportunity to develop physically to the point where they’re the best that they can be. And that’s going to be your job, to make every horse you ride better. You can make every horse better using this training tree because you’re developing the muscle, you’re developing the rhythm, you’re improving how they carry themselves so they can be better at whatever game they’re going to be playing. Your job as the trainer is to never limit the horse, to never make the horse less in what he can be by nature, to always allow the horse to be as much as he can be by nature. Some young horses are pretty enthusiastic about life. So when you first get on and you’re not interfering with how they move, they may choose to run around the arena in three leaps or to buck and twist a little bit. It’s the riders’ job to allow the horse to do any of this for two reasons. First, we want to allow the horse to develop their gaits to the best possible quality and, second, we don’t want to quell their enthusiasm. 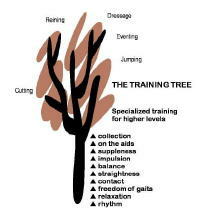 Remember the whole purpose of the training tree and of training in a horse logical sequence is to take what the horse has by nature and make it better. It’s the same with the baby horses. You have to allow them to play, to express their feelings towards what they’re doing in a positive manner. Later, when they understand the language of aid pressures we can tell them what to do but we don’t do that right at the beginning. Eventually all of their enthusiasm gets turned into work that develops the muscles, that develops the gaits, that develops the horse into an athlete. If you have a really enthusiastic horse, you can limit the range of his reactions by limiting the size of the arena where you work him. Some communication with the horse does start right from the beginning but only in the sense that the trainer applies aid pressures that shape whatever the horse is offering them anyway. So it’s horse logical. You’ve been doing groundwork that teaches the horse that when he moves away from a pressure, the pressure goes away. So if he offers to trot, you use a little leg pressure just as he moves off. Leg pressure means to move forward so you apply it just as the horse offers forward movement then you reward by taking the pressure away and giving him a little pat. Eventually the horse begins to connect the dots. But we don’t start systematically applying directional pressures until the horse is comfortable carrying the rider’s weight. In these early stages, the hands and elbows just follow the horse’s motion and allow whatever the horse offers. There’s no interference with the horse’s forward motion. As the horse gets more and more comfortable carrying a rider’s weight, he will start to relax and reach his head and neck forward and down. By showing him a little bit contact without interfering with or restricting his freedom, we start teaching him to move forward seeking contact with the bit. We’re not doing anything fancy at this stage in the horse’s training. We’re just building on the trust that rhythm and relaxation has produced, keeping him comfortable with having us around, showing him what we want in a horse logical way. Rhythm, relaxation and freedom of gaits form a solid base for our training tree. By allowing the horse freedom of gaits, we allow his natural forward movement. With the next step up the tree contact--we encourage that forward movement even more. I got students really quickly once they found out I was a Meredith Manor certified instructor. The student count went up almost before I was ready. I didn’t realize what a difference it would make.